UK companies showcase leading-edge technology, products and services for land-based, naval, aerospace and joint forces military units at Canada's largest defence industry event. 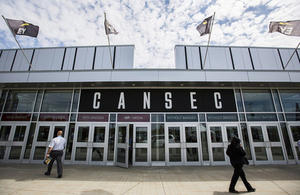 “Collaboration, Industrial Cooperation and Technology Transfer” are the main themes as UK companies seek more industrial cooperation and joint ventures with Canadian companies this week at CANSEC in Ottawa, Canada. CANSEC is also an important opportunity for UK companies with investment in Canada to showcase their capabilities in the maritime air and other domains. As the Royal Navy continues with its modernisation programmes, UK companies in the sector now have proven records for delivery, quality, the ability to meet strict deadlines and the continuing need to respond to the challenge of producing world leading capabilities. The UK Government is keen to foster greater defence industrial co-operation with Canada and will continue to encourage collaborative projects. UK companies have an excellent record of transferring technology and offering innovative solutions, long term logic support and training. The UK’s defence industry also continues to be at the forefront of technological innovation and its international success demonstrates its ability to develop and supply highly capable equipment at competitive prices. The UK delegation at CANSEC is led by Guto Bebb, Minister for Defence Procurement. The UK wants to explore continued cooperation in the defence and security sectors working in partnership with the Canadian government and industry. The UK is keen to engage with the defence and security sectors in both countries through regular dialogue, partnership and technology exchange. The UK and Canada share a proud, historic and prosperous relationship that runs through the fabric of both our nations. We remain firm allies, especially in defence, where we have much to offer each other in terms of research, development, collaboration and training. I look forward to seeing British and Canadian companies continuing to build long-term partnership and develop innovative solutions to meet the needs of our respective Armed Forces.